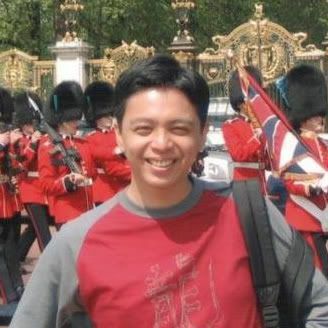 It’s been a while since I’ve participated in some of the monthly blogging events. I don’t even remember what the last Sugar High Friday was that I participated in and it used to be a regular event for me. Since my little bike accident I’ve spent most of my time on the couch, trying not to move. It’s such a waste of time off work, I can’t even bake. I have gotten caught up on some blog reading though and I’ve been sifting through my enormous list of “Stuff Left to Post” (the eggnog ice cream, although it was quite suited to my last post was actually made weeks ago). So when I saw that this month’s SHF theme is All that Glitters, (hosted by The Well Seasoned Cook) I figured I should definitely be able to find something that I’ve already made to suit the theme. A while back I was challenged to make Croquembouche. At the time I knew what it was although it was not something I had ever attempted. Essentially, Croquembouche is a pyramid of cream puffs, glued together with caramel and topped with spun sugar. As regular readers will know, although I love caramel, I have not always had the best of luck with it, going so far as to call caramel, (and hot sugar in general) my nemesis. In order to prepare myself for the challenge, I decided I would do a trial run. What resulted is the mini croquembouche you see here, not perfect by any means but kind of glittery and therefore appropriate for SHF. I thought my practice run went reasonably well and although I knew there were some some wrinkles I hoped they would be ironed out for round two. 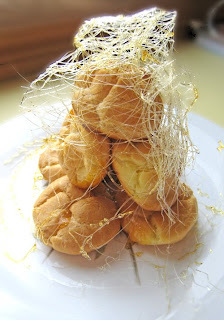 Well somewhere in my croquembouche research I failed to note that despite the fact that the spun sugar decoration is made from hard crack sugar, the actual cream puffs should not be glued together with it as you will never be able to free them from the pyramid if that’s what you use. Silly me, I started making a pyramid with hard crack sugar, essentially cementing the cream puffs together, never to be separated again. I had only made a couple layers like this when it was so graciously pointed out to me by my challenger that I should have added some cream to the sugar so that the cream puffs could be gently pulled apart and eaten. My mistake turned out to be not such a bad thing though because instead of continuing on with making the cream puff pyramid, my challenger suggested I dip half the cream puffs in the hot sugar, let them cool and then dip the other half in chocolate. It was no croquembouche but the dipped cream puffs looked pretty neat, (glittery even) and were quite good that way. I like when failures can be rescued. If you’d like to attempt a Croquembouche, you’ll need pate a choux dough to make the cream puffs, pastry cream to fill them with and caramel to glue them together. After checking out Epicurious though, I think chocolate is definitely an easier medium to use to glue together your croquembouche, as seen here. 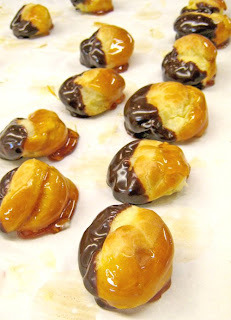 Or, you can do them like I did and dip the cream puffs in some of each! Posted by Brilynn at 1:55 p.m.
Poor you! It sounds like a miserable predicament! If it makes you feel any better, I have suffered in my life time, too. In fat, I have a scar from making croquembouche. Turns out molten sugar makes a good dent in your skin when it hardens there. Hey Brilynn! The mini croq is so cute! Actually, M'sieu Payard does use caramel in cementing the choux together. It's served with a sharp pair of scissors, cutting out groups of three choux at a time. At least you are getting some computer time in! I've been struggling to find any time lately to visit blogs, just sneaking in minutes here and there. I love your glittery croquembouche. That is something that definitely intimidates me! I think I would rather have the shiny chocolate dipped cream puffs than a croquembouche. They looks so yummy! I hope you are starting to feel better! The glittery croq looks amazing! Croquembouche -- my husband and I made one for New Year's Eve one year. Never again! So much work, and so much stress! Croquembouche was my wedding cake! :) Maybe we should have had them use the caramel as glue because it fell apart! I have been bad about SHF as well. But hurray on the mini croq, very cute...and it glitters. I love that hornet's nest of spun sugar! Thanks so much, Brilynn, for turning out a lovely croquembouche for SHF!